Thank you Alom Shaha (@alomshaha) for the incredibly wonderful past week of science education on Real Scientists. 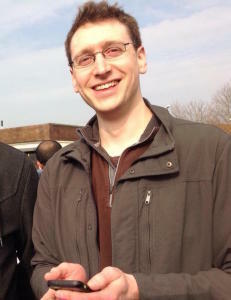 Joining Real Scientists this week is British biochemist-turned-sensor developer Matthew Partridge (@MCeeP). A postdoctoral fellow at Cranfield University, Matthew makes living from going *pew pew pew* (that is totally what lasers sound like right?). In addition to his day job, Matthew also runs a successful science blog, Errant Science, featuring his own witty science-themed cartoons and other interesting anecdotes. Errant Science is also kindly hosting Matthew’s extended biography, written by the man who know him best, himself. Go there and find out all about how you too can learn to cook in a microwave, and what hours PhD students REALLY work. You may also remember that Matthew is a former volunteer administrator here at Real Scientists so clearly our curator intro survey caught him completely unawares. I didn’t really. I just jumped at the opportunities that presented themselves at the time. I don’t think there have been many cases where I’ve had a clear choice between fields. I mostly just keep working on things I enjoy. I shoot lasers at fibre optics until they become terrible at transmuting information but great at detecting stuff. Sadly, this process tends to make them good at detecting EVERYTHING so I then spend a lot of time coating them with other stuff to make them sensitive only to the right stuff. Simple! Actually now I think about it, that wasn’t very clear at all. You’re probably best off reading my tweets this week and finding out! Because I often draw funny cartoons about it – and who doesn’t love cartoons! In addition to my post-Doc job, I also run my own company – Membrane Labs. Days out with my kids. My son is 5 years old and at the magical ‘Why?’ age and I love having long conversations with him about how stuff works. Talking to someone who is amazed by everything is very uplifting. Please welcome Matthew to Real Scientists this week! A little blue birdy also told us there might be some prizes and/or giveaways this week. I for one can’t wait – free stuff FTW!